Tropical Storm Hector moved out of the Central Pacific Ocean and into the Northwestern Pacific Ocean in a much weaker state. NASA's Aqua satellite looked at cloud top temperatures in Hector, revealing fragmented thunderstorms within. 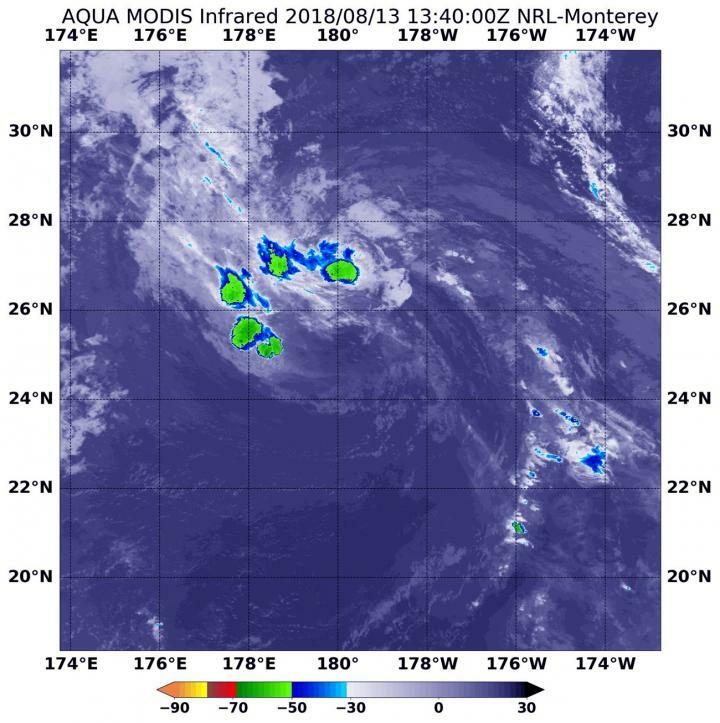 On Aug. 13, Hector crossed the International Dateline into the Northwestern Pacific and at 9:40 a.m. EDT (1340 UTC), the Moderate Resolution Imaging Spectroradiometer or MODIS instrument aboard NASA's Aqua satellite captured an infrared image of Hector. The image showed four small areas of strongest thunderstorms. They were around the center of circulation and west of the center. MODIS infrared data showed that some of those storms had cloud top temperatures as cold as minus 50 degrees Fahrenheit (minus 45.5 degrees Celsius), indicating they are high in the troposphere. At 11 a.m. EDT (5 a.m. HST/1500 UTC), the Central Pacific Hurricane Center or CPHC noted that the center of Tropical Storm Hector was located near latitude 25.3 North, longitude 179.8 West. That's about 250 miles (400 km) southwest of Midway Island. Hector is moving toward the west-northwest near 17 mph (28 kph), and this general motion is expected to continue during the next couple of days. Maximum sustained winds are near 50 mph (85 kph) with higher gusts. Some additional weakening is forecast during the next two days. Tropical-storm-force winds extend outward up to 90 miles (150 km) from the center. The estimated minimum central pressure is 1001 millibars. The CPHC noted that ocean swells will still be a factor as Hector moves away from Hawaii. CPHC said "South and southeast swells generated by Hector will continue to produce elevated seas, with large breaking waves and strong currents this morning across portions of the Northwestern Hawaiian Islands, especially in the vicinity of Midway Atoll and Kure Atoll. These swells will gradually subside later today."